On July 24 this year, a school block near the Loharinag Pala hydroelectric project in Sunagarh, Uttarkashi district, gave away as the rocks under it had become unstable. The subsequent landslide kept the highway blocked for the next three days. "This happened because of road construction. People go about blasting mindlessly, without realizing that the mountain might not be able to support the structures above," said Kamal Singh, an attendant in the school. These mountain ranges are young and susceptible to landslides and avalanches, especially during the monsoon. Blasting, quarrying, tunnelling and dumping of tonnes of loose aggregate on these slopes increase their vulnerability. The other threat that looms large is earthquake. The projects in the state are located in areas of significant tectonic activity. But the developers say there is nothing to fear. "Technology has advanced.Nothing will happen to the dams," said an ntpc official. Harsh Gupta of National Geophysical Research Institute (ngri), Hyderabad, asks, "What about the environment around the dams? The river will be filled with debris if an earthquake happens and the life of a dam will anyway reduce." According to V P Dimri, also of ngri, "Himalayan mountains are loose rocks, especially on the sub-surface, so while tunneling, there might be many soft rocks in the path. If the stratum above the tunnel is less and the rock is soft, chances of subsidence are high." Unfulfilled promises made to villagers are another grey area. Although promises of land and employment are made, most villagers lose out. "Of the 70 families, only 35 people have got jobs as guards. We have no choice because blasting has destroyed forests on which we used to take our animals to graze," said Sardar Singh Rana of Kujjan, a village above the Loharinag Pala powerhouse site. There are some, like Chandraprabha Negi of Lakshmoni village who don't want compensation. Her fields will be submerged when the Kotli Bhel 1b reservoir comes up. "We have been eating of this land for generations. The money will get over in a few days. And I can't even buy land elsewhere because our house is here. A few years ago, the administration took away our land to make a road here. Now the bus that plies on this road does not stop for us because they do not want to take short distance travelers. How can we trust the government on dams?" she asks. Several more such voices in the state await findings of the committee set up by the Union Ministry of Power, which will assess the flow requirements of a river. Depending on its findings, the state will take a call on whether to proceed with the construction of the rest of the power projects. R S Varshney, chief engineer of the Uttar Pradesh Irrigation Department, heads the committee. This has raised several eyebrows. 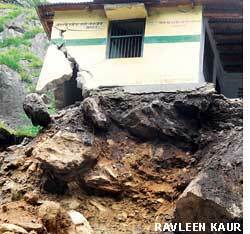 "Varshney has been behind the construction of so many dams in Uttarakhand. A chairperson should be somebody who understands flow mechanics and the gene pool. The central government is represented by ntpc here so there is little hope for objective results," alleges Rajendra Singh of Tarun Bharat Sangh and a committee member. A Centre-state tussle also exists. The two projects that have been put on hold after G D Agarwal protested are state projects. The third, Loharinag Pala, is an ntpc project. "Either all the three or none, will come up. Until then, construction of Loharinag Pala will go on because if we stop the construction, we have to pay compensation to contractors," says Prasad, the chief minister's adviser. Some like Awdhash Kaushal of Rural Litigation and Entitlement Kendra in Dehradun are in favour of the projects. Kaushal has filed a petition against the state for putting the two projects on hold. He says that the state needs the two dams so that it can use the entire electricity generated by them, and not get just 12 per cent free electricity from other projects. Energy generation, however, remains a pipedream. Flawed policies will only give incentive to inefficient projects. If the output of each project is maximized, so many landscape-changing projects won't be required. This can happen if a project is designed on the basis of rigorous hydrological data. Factors such as climate change affecting glacier melt and detailed sediment load studies must be made mandatory even before a project is considered for approval. Planners will need to factor in that a river is a dynamic entity.